Well here we are, the big day has rolled around again, the 5th instalment of Nelson’s Tour de Test Valley on Saturday 16th September is here! Firstly a hugely sincere thank you for entering our sportive in memory of Nelson Pratt. The lanes and climbs you will be riding in the Test Valley were his favourite place to be on his bike, he would be very chuffed to see so many of you enjoying them. Again this year through your online entries alone (over 700!) the event has already raised well over £15,000 for our charity partner CALM, with the figure set to rise with your donations. 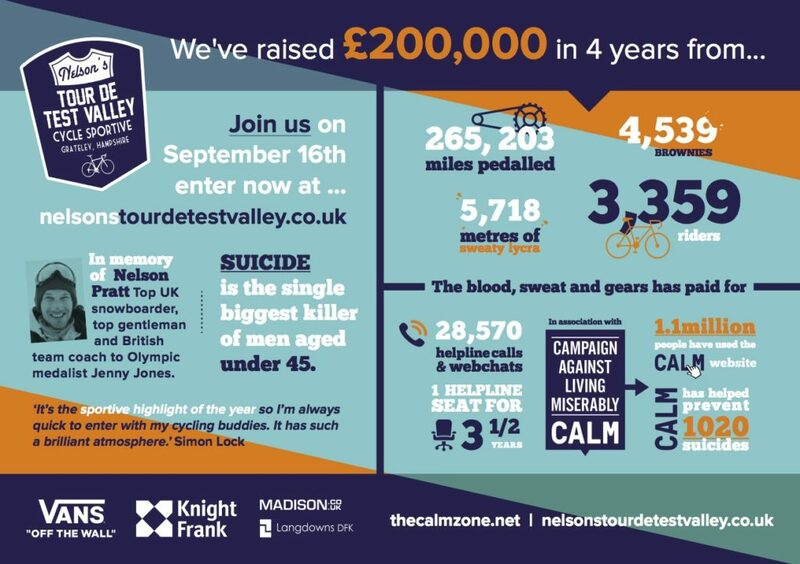 With every hard fought pedal rev your efforts are supporting a great cause and helping raise awareness for male suicide – currently the single biggest killer of young men in the UK, that’s over 12 men a day! Over the last 4 years the event has raised over £200,000, crucially helping CALM employ more staff in it’s call centre, in turn helping save precious lives. PLEASE if you haven’t already set up your CALM fundraising page now, every little bit does really help. A massive good luck and thank you from everyone at CALM. The infographic attached shows the huge impact you have had on preventing male suicide. This year your support will allow us to do so much more. Tag and share infographic alongside your pictures and selfies from the day to raise last minute sponsorship and awareness. SO – have an amazing ride and see you at the finish! To make it super easy to donate to CALM we have set up a text donation number, would be great if you could send a text after you’ve read this! The A303 is due to be shut Saturday EAST BOUND. Please check to see if it affects your travel plans. PLEASE If you get lost for any reason safely retrace your steps to the last sign you saw, or call the emergency number on your rider number. In the past 2 years some signs have been removed by idiots so please be vigilant! Everyone that has pre-ordered a cycle jersey your order will be waiting for you at registration. PLEASE BRING CASH, no card payment available. Our jazzy new cap will be available to buy at RIDE HQ. They are £15 with all proceeds going direct to CALM. This year CALM are bringing some goodies to keep the kiddies amused, please feel free to bring your children to the event, be great to have them part of the day. Finally a huge thank you must go to our event partners VANS Footwear, Knight Frank, Langdown DFK, Madison, Abbots Anne Cycles, Stockbridge Osteopathic Practice, Andy Cook Cycling and Ivan’s Coffee. The event wouldn’t be possible without their incredible support. We really look forward to welcoming you on the day, the Test Valley is ready for your legs and smiles to light it up! Marcus, the Pratt Family, CALM and the NTdTV Team. PLEASE BRING CASH WITH YOU FOR FOOD/BEER ETC – NO CARD PAYMENTS POSSIBLE SORRY! Showers and toilets on site. There are a plenty of great pubs close by in Grateley, Wallop and Amport. * THERE WILL BE SECURE BAG STORAGE IN THE BARN. All routes are available to download for Garmins / GPS devices, attached to this email below. 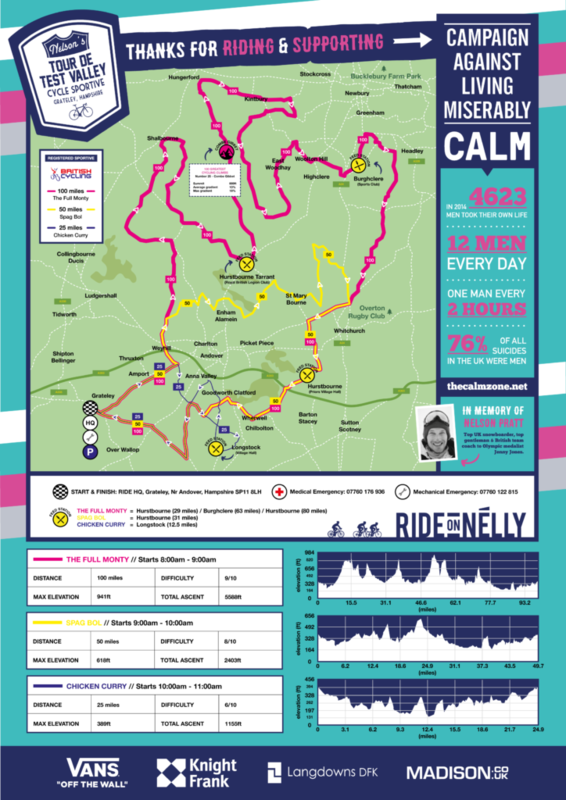 Map of the routes also attached, these will be available at HQ. Map showing the three routes at bottom of this riders brief. These will be available on the day at RIDE HQ to take with you. Award winning Pimhill Farm will also be serving up bowls of their incredible granola, bang a banana in there and you’ve got the perfect kickstart. South West’s coolest coffee barista IVAN’S COFFEE will be brewing his magical dark brews from 0700. Take full advantage of the caffeine hit, medically proven to make the legs faster! ABBOTS ANNE CYCLES will be selling all the key essentials for the day at their stall, and energy food for your ride – as well as giving your bike the once over if needed. EVERY FINISHING RIDER RECEIVES A FREE HOT MEAL & GOODIE BAG ON RETURN – DON’T MISS OUT! ANYONE THAT HAS PRE-ORDERED A CYCLE JERSEY IT WILL BE WAITING FOR YOU AT REGISTRATION – PLEASE BRING CASH OR CHEQUE TO PAY. The one-off cycling jersey is available in unisex sizing, featuring a full zip, three rear pockets and a zipped stash pocket for phone/money. The shirt is priced at £45, cracking value. THERE IS ALSO AN EXCLUSIVE LTD EDITION TOUR DE TEST VALLEY x KNIGHT FRANK CYCLING CAP – priced at £15 this will be for sale on the day. All sales go direct to CALM. On your glorious and triumphant return to Ride HQ you will pass under the finish gantry and receive a token for your FREE MEAL and VANS x CALM GOODIE BAG. Rack your bike and head into the barn to grab your meal then head straight to the bar for a well earnt drink. We hope you’ll stay and have a few celebratory drinks with us. PLEASE TEXT IF YOU CAN.